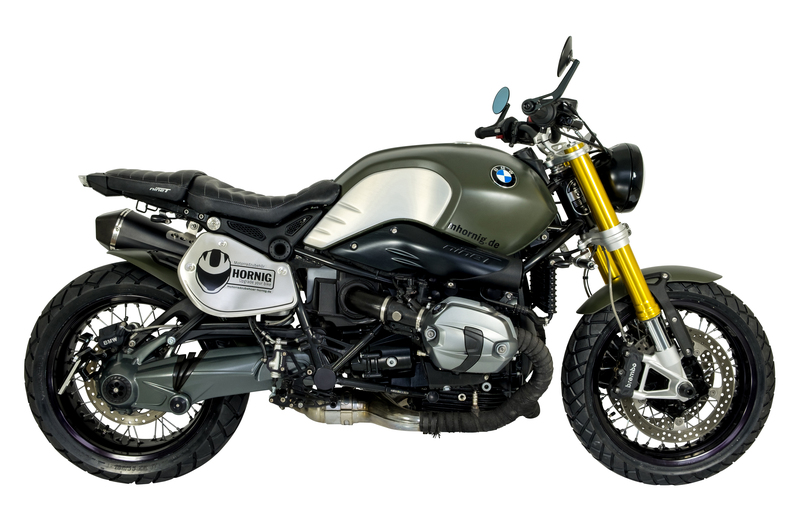 The base for our conversion was a BMW RnineT (model year 2015, 38,000 km). 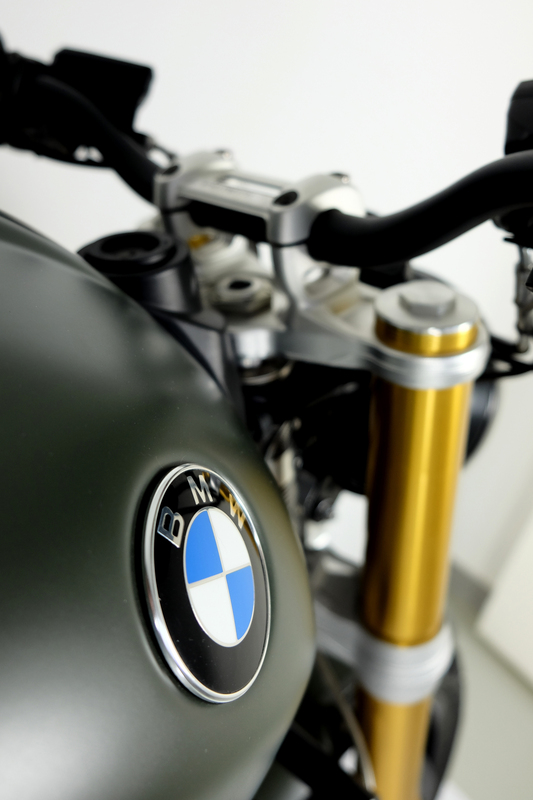 The tank and the front mudguard of the RnineT were painted in the trendy colour mat khaki green. 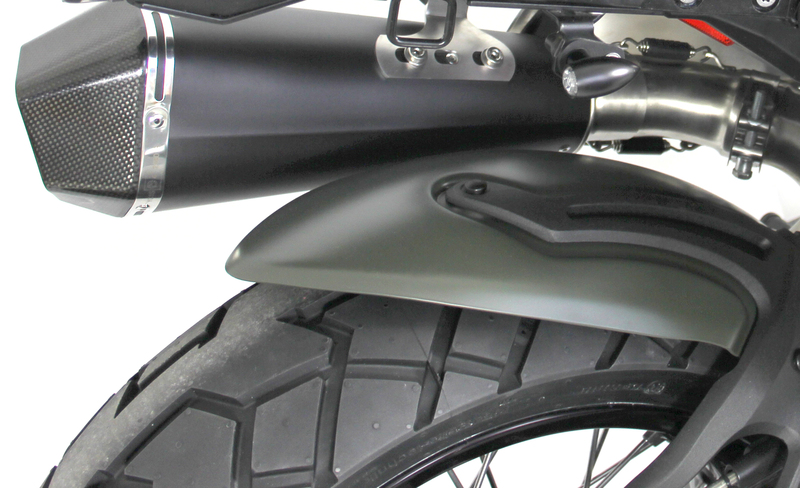 The rear mudguard which we mounted on our RnineT for a better protection against splash water and stone chips also got a new lacquering in mat khaki green. 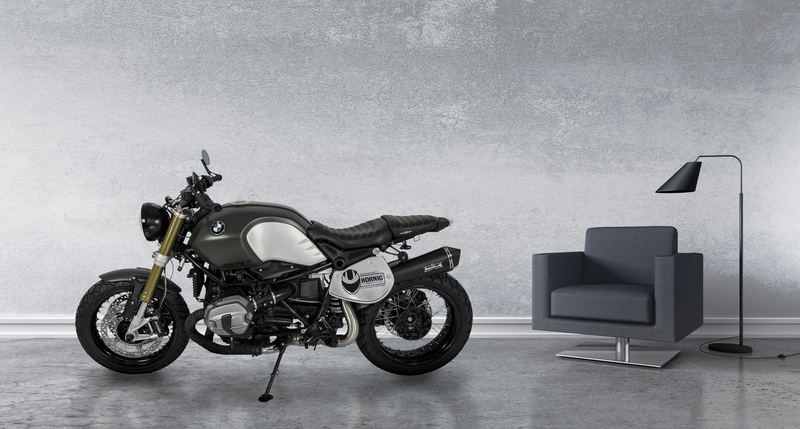 The seat of the RnineT was covered with new black leather and furnished with grey "nineT" writings on both sides. Then we built an individual rear part which was adjusted to the shape of the modified seat. 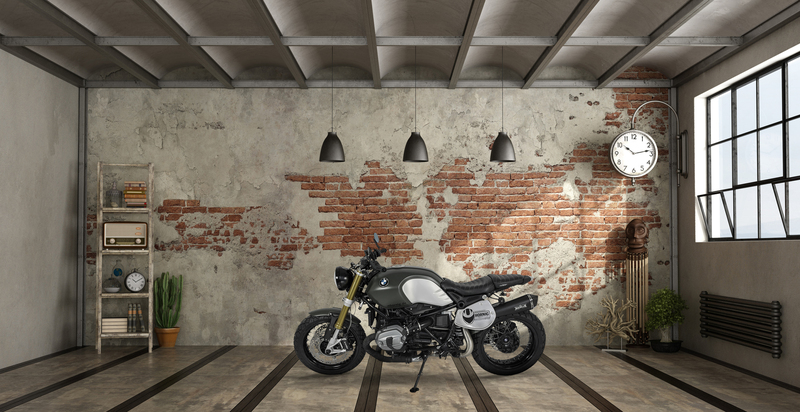 The new rear part does not include the license plate holder anymore and thus emphasizes the puristic overall appearance of the RnineT. As a replacement for the original licence plate holder at the rear, we installed our lateral licence plate bracket. 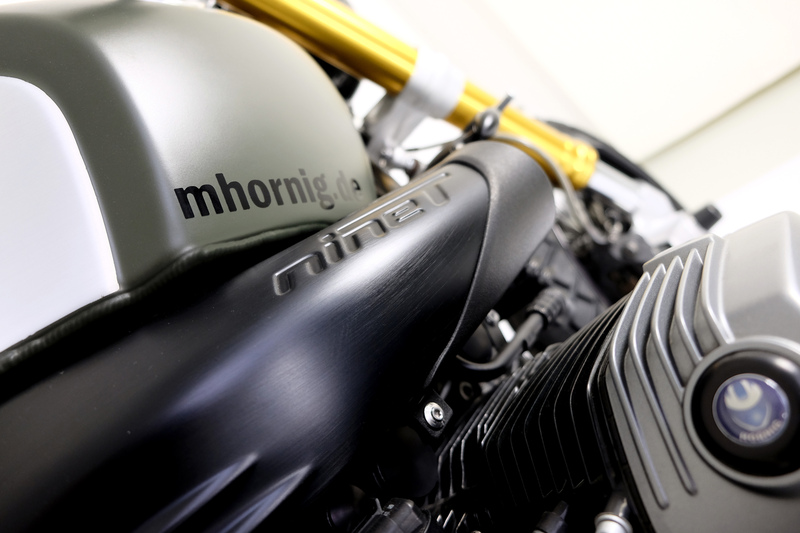 Our Retro side infill panels which are made of aluminium are a true highlight on our RnineT. 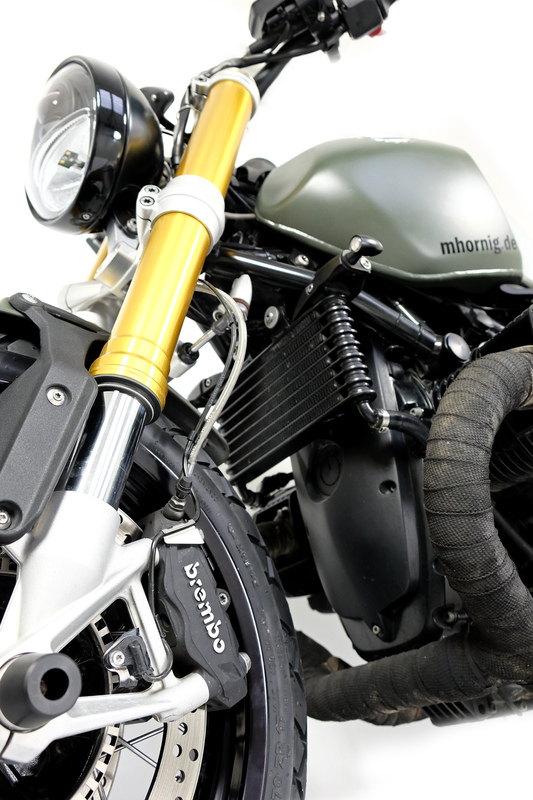 They not only work as a protection against dirt and splash water, but also give a very special, classic look to the motorcycle. 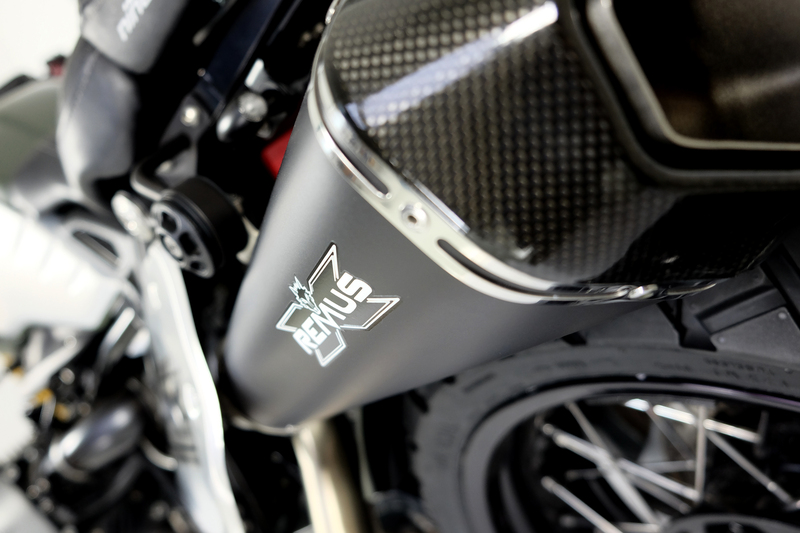 In order to provide our RnineT with a powerful sound, we mounted a black Remus Hexacone exhaust and the exhaust manifold was wrapped with a special black heat protection tape. 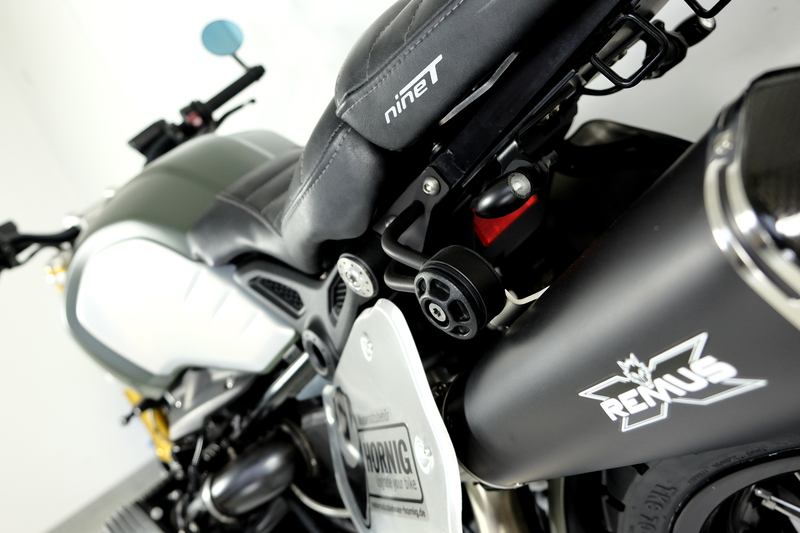 Thus, the exhaust system of our RnineT has a very noble appearance. 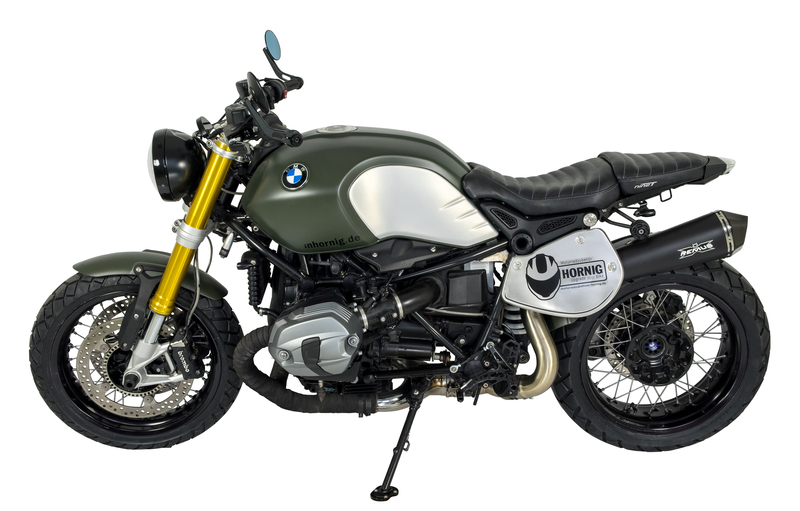 The frame reinforcements on the right and left side and the injection cover were powder-coated in black (original colour: silver) and accord very well with the khaki green colour of the tank and the silver tank side parts. 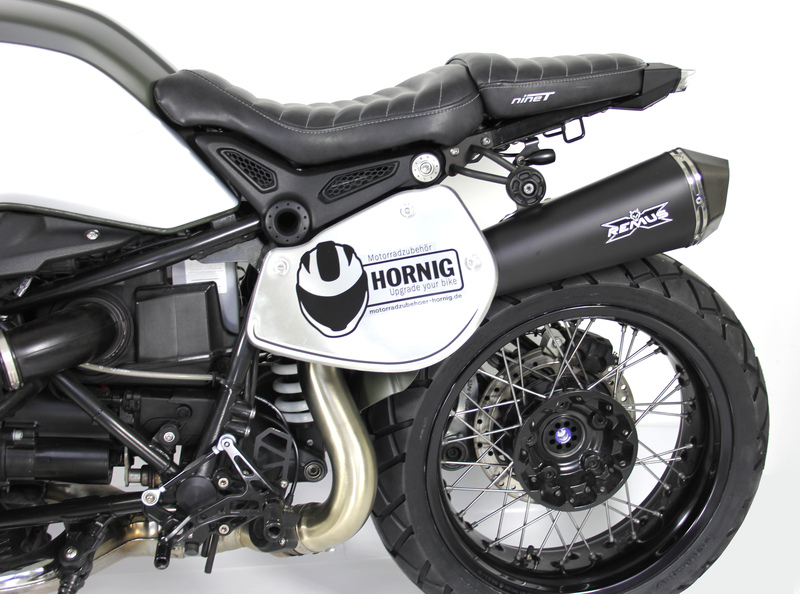 Moreover, we installed a side stand foot enlargement, fork crash protectors, new indicators and a new tank cap on our RnineT. Furthermore, a footrest system was mounted to improve the driving comfort and a new handlebar and mirrors were installed. 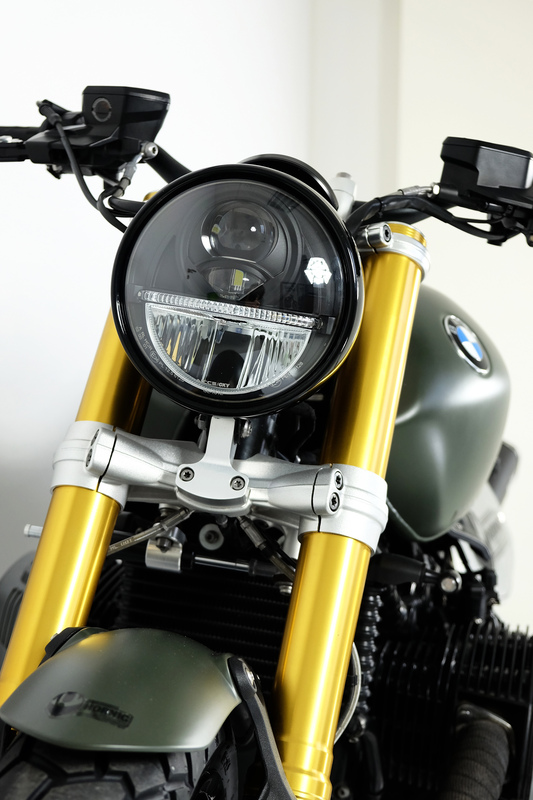 Another highlight of our RnineT is the AC Schnitzer Light Bomb which we mounted into the original lamp ring after the lamp ring was powder-coated in black. The Light Bomb has a LED headlight and produces a very bright, homogeneous and white light and thus contributes to a higher security while driving. 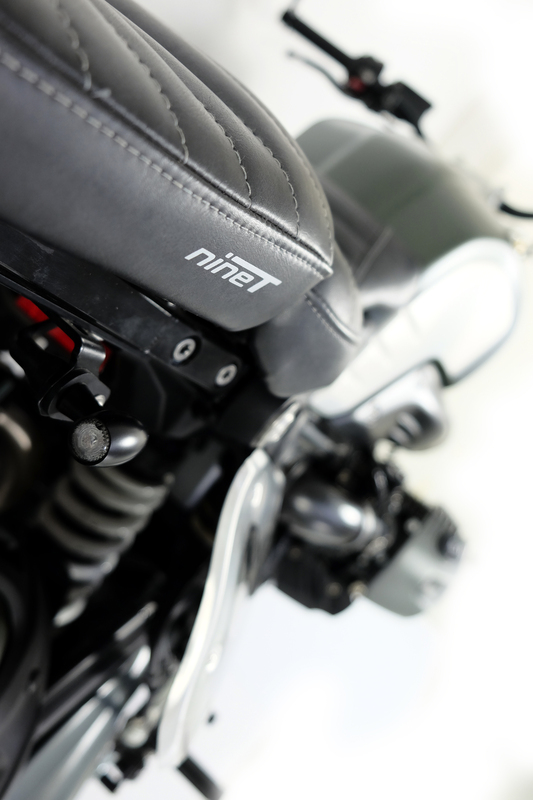 Moreover, a new speedometer and our adjustable brake and clutch levers, which can significantly improve the driving comfort, were installed. 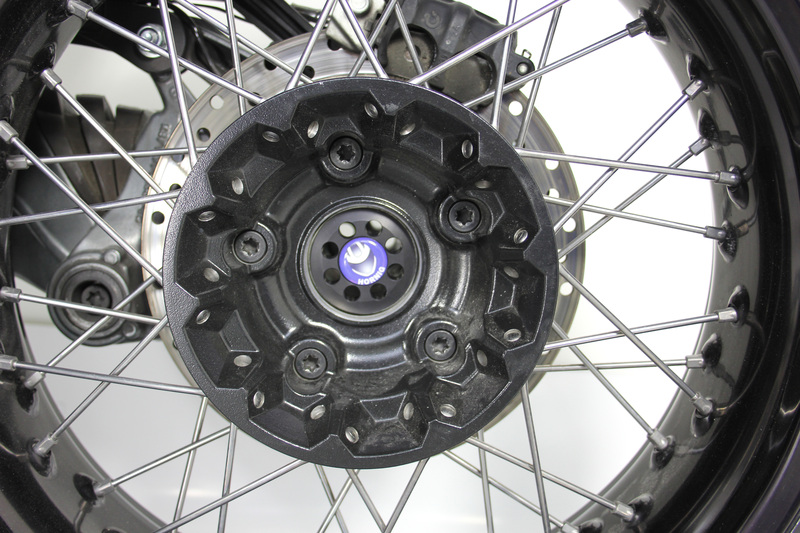 Our black rear wheel centre cover, our black axle pivot cover and our black covers for the swing arm pivot, the engine mounting and the frame are made of anodised aluminium, cover the open holes of the RnineT and thus create a high class look. 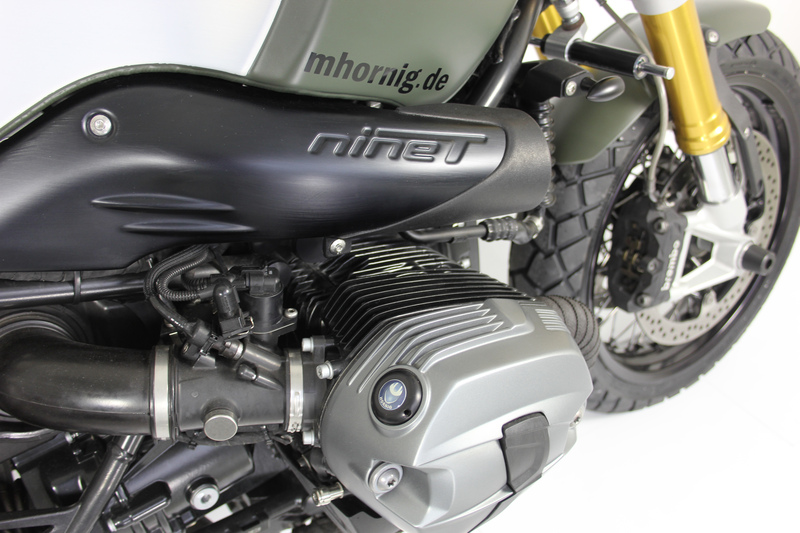 The individual design of our RnineT is completed by our cooler grid, our black oil filler cap with Hornig emblem and our centre cap top yoke. 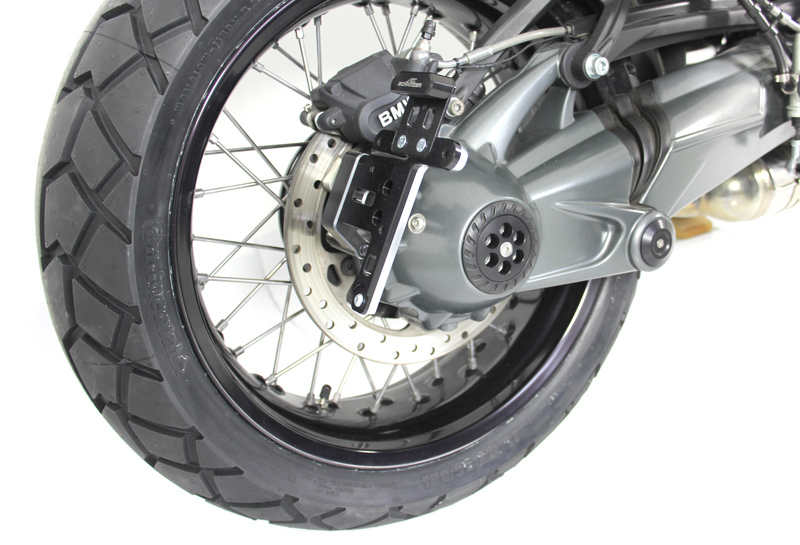 Finally, we equipped our RnineT with new tyres with a slight lug tread (Conti TKC70, front: 120/70 ZR17, rear: 180/55 ZR17).